In the early morning hours of July 11th our nightshift officer observed a male passed out on the front porch of a South Main Street home and investigated. The male, Brian Dominic Carter of Loretto, was in an intoxicated state and had passed out on a couch. 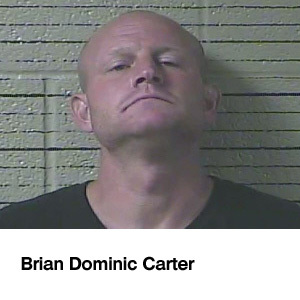 He was arrested for public intoxication and criminal trespassing and booked into the Lawrence County Jail. Around lunch on the 11th we were notified by a local business they had been burglarized, with approximately $3800 worth of items being stolen and $2,600 worth of damage being done to the business. Officers processing the scene collected witness statements and physical evidence that implicated Carter. Last night officers with the Loretto Police Department and Lawrence County Sheriff’s Department executed a search warrant on the Vine Circle residence belonging to Carter. Carter, who had bonded out on the misdemeanor chargers earlier in the day, was arrested and further evidence of the business burglary was recovered. Carter has been charged with burglary, theft over $1,000, and vandalism for the business. He has also been charged with attempted burglary of a habitation after the South Main Street homeowner discovered entry had been attempted through some of the windows of the home. He is being held without bond on these new charges at the Lawrence County Jail. During the investigation a White Ford F350 Flat Bed truck was recovered that we believe to have been stolen from the Southern Lawrence County or North Alabama area along with a pressure washer that was also indicated as being stolen. We have information that Carter, possibly along with others, is responsible for several burglaries and thefts in southern Lawrence County TN and northern Lauderdale County AL area. We would like to stress this is an on-going investigation and have reached out to surrounding agencies in an effort solve as many cases as possible.